Solgar® DLPA 500 mg (DL-Phenylalanine) Vegetable Capsules contain DLPA, a mixture of the natural form of Phenylalanine (L form) with its mirror image (D form). Amino acids are the building blocks of protein and are needed in several internal functions of the body. They are classified as "essential" or "non-essential", with essential amino acids meaning they cannot be manufactured by the body and must be supplied in the diet to maintain good all-round health.Amino acids can be further used by the body to create hormones, enzymes, neurotransmitters, antibodies and nutrient carriers. A suboptimal intake of the essential amino acids increases the body's need for the non-essential amino acids either through diet or supplementation. Foods that increase amino acid intake are meat, beans, cheese and eggs. 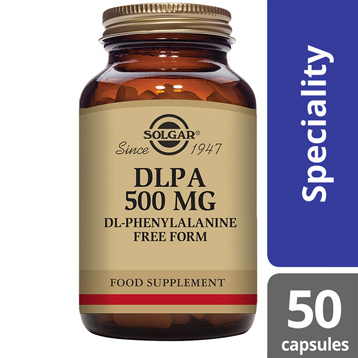 Solgar® DLPA 500 mg (DL-Phenylalanine) Vegetable Capsules comes in a 2 vegetable capsule daily dosage, for easy absorption. Ingredients: DL-Phenylalanine (Free Form) (providing D-Phenylalanine and L-Phenylalanine), Vegetable Capsule Shell: hydroxypropylmethyl cellulose, Anti-caking Agents: (vegetable magnesium stearate, silicon dioxide), Bulking Agent: hydroxypropyl cellulose. DL-Phenylalanine (Free Form) (providing D-Phenylalanine and L-Phenylalanine), Vegetable Capsule Shell: hydroxypropylmethyl cellulose, Anti-caking Agents: (vegetable magnesium stearate, silicon dioxide), Bulking Agent: hydroxypropyl cellulose. For adults, one (1) to two (2) Vegicaps daily with juice or water in between meals, or as directed by a healthcare practitioner. Please note: DLPA is not intended for use during pregnancy or lactation or for those with high blood pressure. CAUTION: PHENYLKETONURICS (PKU) - This product contains Phenylalanine.